Some of us have gone sea diving and experienced the enchanting world of underwater marine life. Have you ever wished to sleep there surrounded by blue water along with exquisite aquatic lives swimming around you? Well, now you can! Lying in the arms of blue water. Grab the brand new experience with this magnificent underwater resort in Maldives and etch it in your memory forever. 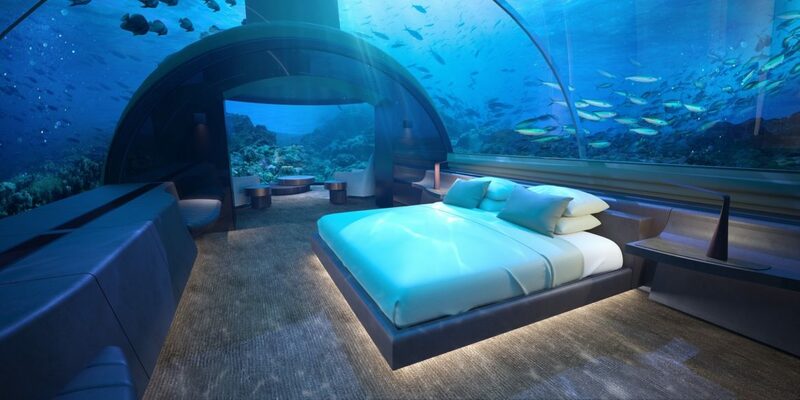 Opened at the Conrad Maldives Rangali Island, the world’s first underwater resort is now a reality. The luxurious resort is a two storey villa, in the heart of Indian Ocean at a depth of more than 16 feet. ‘Muraka’ which translates to ‘coral’ in Dhivehi, the local Maldivian language is the name of this happening resort. You get all the comfort that you can wish for here! Starting from the ground floor of Muraka, it has underwater bedroom lit with bed, shower and all the other comforts of hotel room. The bedroom has an exquisite view of the ocean that showcases marine lives all around which is hell of a soothing sight. Along with these, you also get access to bar, private gym, butler’s quarters, an infinity pool, an elegant ocean-facing bathtub. Situated above ground floor is top floor of Muraka which comes with the ‘relaxation deck’ if you are missing the sun. You can come up and soak yourself in the sun for a while. Like said it’s a once in a lifetime experience and hence the prices will come accordingly. To visit the world’s first underwater resort, Muraka, a whopping $50,000 per night will be charged. You also get a private boat and personal chef to your service. 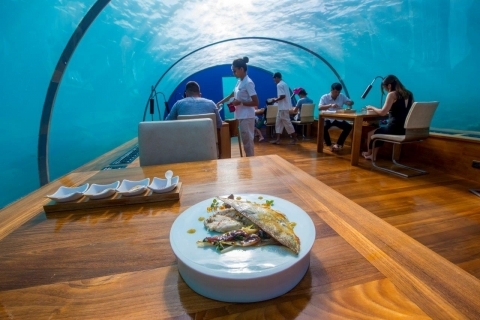 Ithaa- The elegant Underwater Five-star Restaurant. Before Muraka, the hotel ventured into building Ithaa, an elegant five-star underwater restaurant. The meaning of ‘Ithaa’ is ‘mother of pearls’ in Dhivehi language. This under-sea restaurant lying 5 meters below the sea-level. Also situated at the Conrad Maldives Rangali Island. The jetty connects the Muraka to the Ithaa and rest of the resort. The owners of this luxurious expansion confirm that the Muraka was established keeping in mind the concerns of environment. The aquatic life and nature there was taken into consideration. The building was first built on land in Singapore and then shipped to Maldvies. The engineers lowered this ready-made building into water and later fixed it in place through concrete pylons. This helped it stay in one place and not just shift during rough waters. If underwater resorts are not your cup of tea, you can also avail floating villas at Conrad which also gives you a similar experience.